Name Variation Robert Jacob Waldecker was also known as R. J.
Robert Jacob Waldecker was born on 14 October 1893 at Illinois. He married Doris J. Schumacher, daughter of Henry Martin Schumacher and Lizzie C. Quirk, before 1921. Robert Jacob Waldecker died on 6 March 1954 at Illinois at age 60. He was buried after 6 March 1954 at Calvary Cemetery, Freeport, Stephenson, Illinois. Married Name April 1921 As of April 1921,her married name was Hill. Madelyn L. Schumacher was born in 1898 at Illinois. She was the daughter of Henry Martin Schumacher and Lizzie C. Quirk. Madelyn L. Schumacher married Oscar H. Hill Jr. in April 1921 at Chicago, Cook, Illinois, Madelyn Schumacher and Oscar Hill Jr marriage announcement. Madelyn L. Schumacher was buried in 1978 at Oakland Cemetery, Freeport, Stephenson, Illinois. Name Variation William Schumacher was also known as Meredith. William Schumacher was born circa 1902 at Illinois. He was the son of Henry Martin Schumacher and Lizzie C. Quirk. Oscar H. Hill Jr. was born on 22 September 1896. He married Madelyn L. Schumacher, daughter of Henry Martin Schumacher and Lizzie C. Quirk, in April 1921 at Chicago, Cook, Illinois, Madelyn Schumacher and Oscar Hill Jr marriage announcement. Oscar H. Hill Jr. died on 18 February 1944 at age 47. He was buried after 18 February 1944 at Oakland Cemetery, Freeport, Stephenson, Illinois. Married Name 26 February 1924 As of 26 February 1924,her married name was Abing. Martha M. Schmitz was born circa 1904 at Wisconsin. She married Charles Edward Abing on 26 February 1924. Martha M. Schmitz died in 1966. 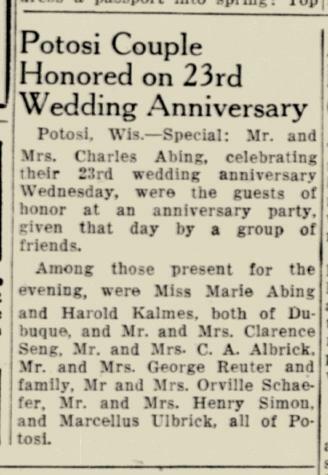 On 26 February 1947 Charles E and Martha (Schmitz) Abing 23rd wedding anniversary celebration. Jamie Dye married Lola Rose Droessler, daughter of Joseph John Droessler and Rose Flogel. Leo J. Wedig married Gertrude Leary. Married Name Her married name was Wedig. Gertrude Leary married Leo J. Wedig. Mark Adams married Jean Frances Kieler, daughter of Lillard H. Kieler and Hazel H. Lenstra, on 30 May 1950 at Dubuque, Iowa. Mark Adams died on 14 September 2002. Gene Sullivan married Marilyn Kieler, daughter of Lillard H. Kieler and Hazel H. Lenstra. Patrick Rea married Ruth Ann Kieler, daughter of Lillard H. Kieler and Hazel H. Lenstra. Married Name 17 January 1976 As of 17 January 1976,her married name was Steinhoff. Mary F. Heilman was born on 16 August 1950. She married John S. Steinhoff Sr., son of Edward Lorayne Steinhoff and Lillian G. Vannatta, on 17 January 1976 at Iowa. Mary F. Heilman died on 5 June 2016 at Cuba City, Grant, Wisconsin, at age 65 Mary F. (Heilman) Steinhoff, 65, of rural Cuba City, Wisconsin, passed away peacefully early Sunday morning, June 5, 2016, at Epione Pavilion in Cuba City following a recent stroke. Services will be 12:00 noon on Wednesday, June 8, 2016, at Holy Ghost Catholic Church in Dickeyville with Rev. Bernard Rott officiating. Burial will be in the church cemetery. Friends may call from 10-11:45 a.m. Wednesday at the church before the service. Casey Funeral Home & Cremation Services of Cuba City is in charge of arrangements. Mary was born on August 16, 1950, the daughter of Frank and Margaret (Hartung) Heilman. Mary graduated from Wahlert High School in Dubuque, Iowa, in 1968. She married John Steinhoff on January 17, 1976, in Asbury, Iowa. He preceded her in death on July 30, 2009. Mary was a homemaker. Mary enjoyed going to local church picnics and festivals and going for rides to visit her relatives. She took great pride in living in her quiet country home. Survivors include a sister, Diane Smith; a niece, Connie Studnicka; a great-grandnephew, Ryan Studnicka; and many cousins. In addition to her beloved John, she was also preceded in death by her parents and a brother-in-law, Leo Smith. Terry D. Droessler was born on 3 November 1952 at Wisconsin. He was the son of Donald V. Droessler and Marie E. Langkamp. Terry D. Droessler died on 19 October 2017 at Wisconsin at age 64 Terry D. Droessler, 64, of Potosi, Wisconsin, sawed through the gates of heaven Thursday, October 19, 2017, at home surrounded by his loving family after a short courageous battle with lung cancer. Terry was born on November 3, 1952, in Lancaster, Wisconsin, the son of Donald and Marie (Langkamp) Droessler. He married the love of his life, Marlene “Beanie” Gillen on June 17, 1972, at Immaculate Conception Church in Kieler, WI. Terry was employed by John Deere for 30 years retiring in 2002. After his retirement, he went to work doing some of his true passions; logging, cutting firewood and spending time at his log cabin “paradise”. He was a lifelong avid hunter. Most of all, he enjoyed spending time with his kids and grandkids. Words cannot express the sadness being felt by the loss of such a wonderful man and he will be truly missed by so many. One of his most famous sayings was “You’re going to miss me when I’m gone” and there is nothing more truthful than this. 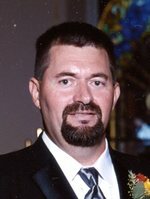 Terry was a husband to Beanie, of Potosi; father to Jenni (Larry) Larson, of Sun Prairie, WI and Jessie (Ben) Gavinski, of Potosi; Papa to Jared Wunderlin, Brianna Gavinski, Zachary Larson, Brianna Larson and Mason Gavinski; a brother to Arleen (Fran) Ouderkirk, of Sherrill, IA, Gary (Deb) Droessler, of Potosi, and David Droessler, of Platteville; brother-in-law to Jug (Pam) Gillen, of Kieler, Sitsy (late, Larry) Koeller, of Kieler, Sandy (Clete) Jerrett, of Lancaster, John (Linda) Gillen, of Dubuque, IA and Vicki (fiancé, Joe) Haverland, of Hazel Green. He is further survived by several family and friends and a special, life-long best friend, Tom Droessler. He was preceded in death by his parents, Donald and Marie; two brothers, Wayne and Merlin; and his father and mother-in-law, Cracker and Edna Gillen. The family would like to extend a special to thank Dr. Wagner and Dr. Hermann and their staff; the exceptional nurses and staff of Finley Hospital; Hospice of Dubuque; and the many family members and friends for their amazing care, compassion and support. A Terry Droessler Memorial Fund has been established, in lieu of plants and flowers. Services will be 7 p.m. Monday, October 23, 2017, at St. Andrew Catholic Church in Tennyson with Rev. Richard Leffler officiating. A private family burial will take place. Friends may call from 2 to 6:45 p.m. Monday at the church before the service. Casey Funeral Home & Cremation Services of Cuba City is in charge of arrangements. Wayne Droessler was the son of Donald V. Droessler and Marie E. Langkamp. Wayne Droessler died before 2017. Merlin Droessler was the son of Donald V. Droessler and Marie E. Langkamp. Merlin Droessler died before 2017. Name Variation Beverly Margaret Wehnke was also known as Bev. Married Name 14 November 1953 As of 14 November 1953,her married name was Miles. Beverly Margaret Wehnke was born on 14 October 1935 at Platteville, Grant, Wisconsin. She was the daughter of LeRoy Wehnke and Velma Leslie VanNatta. Beverly Margaret Wehnke married Roger C. Miles on 14 November 1953 at Platteville, Grant, Wisconsin. Beverly Margaret Wehnke died on 16 October 2017 at Wisconsin at age 82 Beverly M. "Bev" (Wehnke) Miles, 82, of Platteville, Wisconsin, passed away peacefully at Manor Care surrounded by her family on Monday, October 16, 2017, after a prolonged illness. Services will be 4:00 p.m. Friday, October 20, 2017, at Calvary Baptist Church in Platteville with Pastor Dave Barna officiating. A private family burial will take place at Hillside Cemetery. Friends may call from 1:00-3:45 p.m. Friday at Calvary Baptist Church in Platteville before the service with a luncheon following the service in the church basement. Casey Funeral Home & Cremation Services of Cuba City is in charge of arrangements. Beverly was born on October 14, 1935, in Platteville, Wisconsin, the daughter of LeRoy and Velma (VanNatta) Wehnke. She graduated from Platteville High School in 1953. Shortly after she married Roger C. Miles on November 14, 1953, at the United Methodist Church in Platteville. He preceded her in death on December 13, 2006. Beverly held a job from the age of 17; first at McCellan's Dime Store for three years, then at Virtue's Studios for 15 years, and finally at Farm and Fleet for 29 years before retiring. After retirement she worked part-time at Katie's Place, the Pointer Café, and babysat for her beloved great-nephews, Reise, Owen, and Eli Palzkill-Webb. She enjoyed dancing every Saturday night with her husband until his passing. She also enjoyed many hours of playing cards with friends and family. Some of her fondest memories were of family vacations and traveling. Holidays were always highlights in her life because of the time she could spend with her loved ones. Words cannot express the sadness being felt by the loss of such a wonderful person and she will be truly missed. Survivors include two sons, Michael C. Miles (fiancée Barb Brunton), Platteville, and Craig W. Miles (Suzy Moen), Dodgeville; a daughter, Michelle (Vernon) Faust, Cassville; two sisters, Delores (Warren) Nicholas, Belmont, and Carol (Raymond) Palzkill, Mineral Point; one brother, Mervin (Susan) Wehnke, Platteville; three sisters-in-law, Janice (Eugene) Digman, Platteville, Donna (Delbert) Pluemer, Platteville, and Vicki Miles, Platteville; one brother-in-law, Keith (Audrey) Miles, Cascade, IA; six granddaughters, Melissa (Clem Polhill) Miles, Platteville, Samantha (Joel) Kirkpatrick, Fairfield, CA, Tiana Faust, Cassville, Alyssa Miles, Dickeyville, Trisha Faust (fiancé Jamie Peacock), Garnavillo, IA, and Savannah Mabra, Aurora, MO; four great-grandchildren, Mackenzie Miles, Hunter and Taylor Hutchroft, and Andrew Kirkpatrick; and several nieces, nephews, great-nieces, and great-nephews. She was preceded in death by her parents, LeRoy and Velma Wehnke; her parents-in-law, Harold and Mary Miles; her husband, Roger Miles; two brothers-in-law, John Miles and Richard Goke; and two infant siblings. Roger C. Miles married Beverly Margaret Wehnke, daughter of LeRoy Wehnke and Velma Leslie VanNatta, on 14 November 1953 at Platteville, Grant, Wisconsin. Roger C. Miles died on 13 December 2006. Carl Musielewicz married Marie J. Tobin, daughter of Francis Richard Tobin and Bertha Barbara Pluemer, in 2010. Gary Edward Elskamp was born on 3 May 1955. He died on 5 December 2016 at age 61 Gary Edward Elskamp, 61, of Potosi, WI, entered into eternal life peacefully with his daughter by his side on Monday, December 5, 2016, at Agrace Hospice in Fitchburg, following 20 years of fighting four different cancers. Ten years after his initial diagnosis of leukemia, he received a bone marrow transplant from his sister Esther. After enduring years of graft vs. host disease, Gary was diagnosed with Glioblastoma in 2014. Over the last two years, Gary was treated for lymphoma and skin cancer as well, and underwent numerous surgeries and rounds of radiation. Gary never complained about any of his ailments and always thought someone else had it worse off than him. He had a heart of gold and was a softy for anyone in need. Gary’s family was his world and he fought hard for them. Gary was born May 3, 1955, to Mahlon and Hannah (Reynolds) Elskamp in Potosi, WI. He worked various jobs including Caradco, John Deere, and as the St. Andrew Thomas School custodian. He attended Southwest Tech and then started his own business, Gary’s TV, in Cuba City with his wife Kathy. He also owned and operated the carwash next door. He worked hard throughout his career, and made many friends along the way. He enjoyed lending a hand at any fundraising event and also served as president of Catholic Financial Chapter 42. Gary married his high school sweetheart, Kathy Vogelsberg, on December 13, 1975. They had three children, Tony (Lisa) of Dubuque, Andy (Kimberly) of Madison, and Thresia of Lake Charles, LA. Gary loved following his children in their sporting adventures across the country and was in attendance every chance he had. He was an avid hunter and enjoyed spending time in the woods with his family. Gary’s love for his grandchildren topped all. Gary is survived by his wife, Kathy, of 41 years; their children; and four beautiful grandchildren, Kennedy, Carter, Elizabeth, and Emma. He is also survived by his siblings, Marion Mason, of Potosi, Neil (Barb), of Chetek, Carl (Judy), of Bountiful, UT, Esther (Tim) Hesse, of Lodi, and Keith (Becky), of Potosi; his sisters-in-law, Shirley, of Topeka, KS and Mary Lou, of Kieler; and his mother-in-law, Marie (Tobin) Vogelsberg. He was preceded in death by his parents; siblings, Leo, Suzie, Mark, and Mary; brother-in-law, Joel Mason; and father-in-law, Milton Vogelsberg. Services will be 11:00 a.m. Saturday, December 10, 2016, at St. Andrew Church in Tennyson with Rev. Richard Leffler officiating. Burial will be in the church cemetery. Friends may call from 4-8 p.m. Friday at the church and from 9:30-10:45 a.m. Saturday at the church before the funeral mass. Casey Funeral Home & Cremation Services of Cuba City is in charge of arrangements. Married Name Her married name was Droessler. Helena Timmerman was the daughter of John Timmerman and Mary Berning. Helena Timmerman married Leon J. Droessler, son of Joseph John Droessler and Rose Flogel. Helena Timmerman died before 2016. Gene Droessler married Rita (?). Gene Droessler was born after 1920. He was the son of Joseph John Droessler and Rose Flogel. Gene Droessler was the best man at the wedding of Virgil Frank Droessler and Virginia Ann Kerkenbush on 25 November 1941; Virginia Kerkenbush and James Droessler marriage announcement. Gene Droessler died before 2016. Ernie Droessler married Beverly (?). Ernie Droessler was born after 1920. Ernie Droessler died before 2016. Beverly (?) married Ernie Droessler, son of Joseph John Droessler and Rose Flogel. Beverly (?) died before 2016. Name Variation Louetta (?) was also known as Luetta M. (?). Louetta (?) married Jerry Droessler, son of Joseph John Droessler and Rose Flogel. Louetta (?) was born in 1924. She was buried in 2001 at Immaculate Conception Church Cemetery, Kieler, Grant, Wisconsin. Rita (?) married Gene Droessler, son of Joseph John Droessler and Rose Flogel. Rita (?) died before 2016. Married Name Her married name was Dye. Nickname Lola Rose Droessler also went by the name of Babe. Lola Rose Droessler married Jamie Dye. Lola Rose Droessler was born after 1920. She was the daughter of Joseph John Droessler and Rose Flogel. Lola Rose Droessler died before 2016. Sister Dorothy Droessler OSF was born after 1920. Name Variation Albin L. Droessler was also known as Al. Albin L. Droessler was born on 6 April 1925 at Grant, Wisconsin. Albin L. Droessler married Bernadette M. Splinter on 8 May 1946 at Grant, Wisconsin. Albin L. Droessler died on 2 August 2016 at Cuba City, Grant, Wisconsin, at age 91. He was buried after 2 August 2016 at Immaculate Conception Church Cemetery, Kieler, Grant, Wisconsin. Name Variation Bernadette M. Splinter was also known as Bernie. Married Name 8 May 1946 As of 8 May 1946,her married name was Droessler. Bernadette M. Splinter was born on 4 May 1929. She married Albin L. Droessler, son of Joseph John Droessler and Rose Flogel, on 8 May 1946 at Grant, Wisconsin. Bernadette M. Splinter died on 15 July 2014 at age 85. She was buried after 15 July 2014 at Immaculate Conception Church Cemetery, Kieler, Grant, Wisconsin. Name Variation Michael J. Rupp was also known as Mike. Michael J. Rupp was born on 18 September 1959 at Hazel Green, Grant, Wisconsin. He was the son of Ambrose F. Rupp and Shirley Carole Watters. Michael J. Rupp died on 23 October 2015 at Cuba City, Grant, Wisconsin, at age 56 Michael J. "Mike" Rupp, 56, of Shullsburg, Wisconsin, died Friday, October 23, 2015, at Epione Pavilion in Cuba City. A private family service will be held at a later date. Casey Funeral Home & Cremation Services of Cuba City is in charge of arrangements. Mike was born on September 18, 1959, in Hazel Green, Wisconsin, the son of Ambrose and Shirley (Watters) Rupp. He married Lori Lee Richardson on May 10, 1980, at the New Diggings Primitive Methodist Church. Mike was a quality control supervisor for many years. He was an amazing husband, father and grandfather. He will be remembered for the years he spent dedicating his time to coaching youth sports. Mike enjoyed spending time with his family and will be forever missed by all who knew him. He loved hunting, fishing, gardening and cooking. Mike also mastered the craft of home brewing beer and wine making. His family considered him a jack of all trades and will celebrate his life forever. Survivors include his wife Lori Lee, of Shullsburg; a daughter, Angela (Tim) Leitzinger, of Shullsburg; two sons, Andrew (fiancée Jennifer Kane) Rupp and Patrick Hendricks, both of Dubuque; his parents, Ambrose and Lois Rupp, of Benton, and Shirley Forrester, of Las Vegas, Nevada; four sisters, Debra (Eugene) Mueller, of Shullsburg, Rhonda (Mark) Shafor, of Flagstaff, Arizona, Lisa (Ron) Jersey, of Henderson, Nevada, and Jamie (Rich) Empey, of Las Vegas, Nevada; and a grandchild, Madeline Hendricks. He was preceded in death by a sister, Lori Lee Rupp; his paternal grandparents, Peter and Odelia Rupp; and maternal grandparents, Jerry and Olive Watters.